Aquaponics systems have been used for thousands of years. Why is it only now that people are starting to see the applicable nature of this efficient farming technique? One of the main reasons is due to an increasing disparity between the rapidly rising global population and the lack of food and water to sustain such an enormous number of people. Many of today’s researchers have attempted to focus on this topic. However, it is not enough to only educate adults about these challenges. The teenagers of today will be the workers of tomorrow. It is imperative that high school students learn about food sustainability and water conservation now to prepare them for the future. To teach these topics effectively, we need to consider integrating them into the current curriculum. Aquaponics is the ideal hands-on experience for high school students to learn not only about sustainability, but also about systems thinking and problem solving skills. Even if each of those 11 billion people was represented by just one measly second, that would still add up to almost 350 years! Where is the food for these 11 billion people going to come from? Can we reduce agricultural water use and still feed all these people? 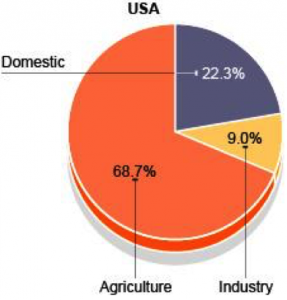 Currently, according to the BBC graph on the right, almost 69% of the fresh water used in the United States goes towards agriculture. In an interview with Dr. Nitin Baliga of the Baliga Lab at the Institute for Systems Biology, he said, “In the next thirty years, we will need about 4.5 trillion cubic meters of water just for agriculture, and the supply would be 2.2 trillion cubic meters.” Further into the interview, Dr. Baliga also said, “Even with all the technological improvements, they [researchers] project a 30% gap in water availability versus demand.” Clearly, water conservation needs to be one of our top priorities. While it is a growing initiative, solely cutting back on personal daily water use is not enough. 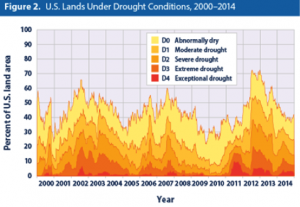 Furthermore, the percentage of U.S. land under drought conditions has grown in recent years, especially land experiencing exceptional drought. How do aquaponics systems compare to conventional agriculture? Aquaponics is one of the best solutions available not only because it makes a huge impact in terms of water conservation, but also because it is incredibly effective, efficient, and sustainable. According to Sylvia Bernstein’s article, “The Way of the Future: Aquaponics vs. Traditional Agriculture,” an aquaponics system has the potential to produce 50,000 pounds of tilapia and 100,000 pounds of vegetables per acre per year, while a single grass fed cow needs eight acres of grassland to grow. Another notable advantage of using aquaponics over traditional agriculture is its decreased reliance on soil, as we are experiencing a decrease in arable land. That’s right – a soilless system with significantly higher production rate per acre per year compared to traditional agriculture! In addition, aquaponics has been shown to use less than ten percent of the water used in traditional agriculture (Bernstein, 2015). Now that would definitely result in a significant amount of water being conserved. It seems aquaponics truly has multiple advantages over conventional agriculture and has demonstrated its effectiveness as a farming system. To some, having their own aquaponics system at home to grow plants seems like a scene of the future. Yet, as Bernstein writes, Hong Kong and Singapore already produce over 20% of their meat and vegetables within city limits. With a sustainable system, even city dwellers can now grow some of their own food! The way the system functions is surprisingly easy to understand. It combines the practices of aquaculture (farming aquatic animals) with those of hydroponics (growing plants without soil). Water is recirculated between a vegetable grow bed and a fish tank. After the fish have been fed, they excrete ammonia as a waste product. Bacteria then fix ammonia into nitrite and then into nitrate through a process called nitrification. While the ammonia and nitrite are toxic to fish, nitrate is absorbed by the plants’ roots as nutrients. The plant roots keep the water filtered and clean when it returns back to the fish tank. Thus, there is no need for chemical fertilizers since the plants can obtain the necessary nutrients from the system alone. How does this relate to high school students? 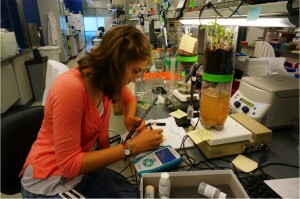 Educating high school students with an aquaponics system is unlike the typical education many students are now receiving. Instead of giving students a formula or rule they can just plug numbers into, building and sustaining an aquaponics system is much like deriving that formula itself. There is much experimentation and testing involved in setting up a sustainable system, which requires student patience and perseverance. Instead of mindlessly substituting numbers for variables, students are encouraged to use systematic thinking to comprehend why increasing the number of fish affects the plants in this way or why some plant species grow better than others. It pushes a student to problem solve rather than memorize. Here, Anika Thomas-Toth, an ISB Baliga Lab summer intern of 2015, takes samples from the mini aquaponics system. Introducing aquaponics systems to schools also will create a foundation of knowledge on how to optimize the aquaponics for the future. High school students could be collecting data that others will use in the years to come. Through working at the Institute for Systems Biology (ISB), I learned that while aquaponics is slowly gaining popularity, there is still little research and recognition of this method as being a sustainable option for agricultural production in the future. It was not until I applied to be an intern at ISB that I realized this efficient system for growing plants and raising fish existed. Aquaponics systems have the ability to teach skills that will allow students to solve problems they may experience in our planet’s future. That is why it is crucial to start from the roots (pun intended) and educate the younger generations – specifically high school students. A curriculum that integrates the teaching and hands-on experience of working with an aquaponics system can increase a student’s awareness of not just food sustainability, but also of multiple facets of the scientific field such as biology, physics, chemistry, zoology and ecology. In addition, an aquaponics system also sets itself apart from the lab experiments done in school because of the interwoven nature of the living networks. While most teachers have seen the experiments conducted in their classrooms for years and know the ideal result, the dynamic aquaponics system can be unpredictable, even for seasoned aquaponic-lovers. Even scientists can be found pondering how to solve a new question about their aquaponics system. Students learn to approach problem solving and experimentation in a way that prompts them to consider complex interactions and determine the effect of all components on each other. This does not mean I am against lab experiments done in school. In fact, lab experiments are part of the tried and true curriculum in high school science classrooms and are essential to understand an aquaponics system’s components and their interactions. Instead, an aquaponics system can be a supplementary addition to the curriculum that allows students to apply their scientific knowledge. What better way to learn about science than to apply theory to real world issues? Why not educate the leaders of tomorrow about sustainability and food production, today? High school does not just have to be preparation for college and a career; it can also be preparation for students as future members and problem solvers of society. If you are ready to join this revolution, click here to learn more about the Institute for Systems Biology’s “Project Feed 1010”, which is working toward doing just that. Kunzig, Robert. “A World with 11 Billion People? New Population Projections Shatter Earlier Estimates.” National Geographic. National Geographic Society, n.d. Web. 20 Aug. 2015. <http://news.nationalgeographic.com/news/2014/09/140918-population-global-united-nations-2100-boom-africa/>. “The Global Demand for Water.” BBC. BBC, n.d. Web. 20 Aug. 2015. <http://www.bbc.co.uk/schools/gcsebitesize/geography/water_rivers/water_usage_rev1.shtml>. Baliga, Nitin. Interview by Xin Yi Chen et al. 16 July 2015. 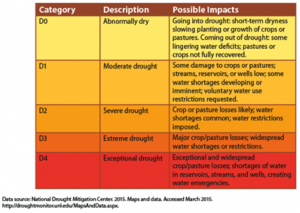 “Climate Change Indicators in the United States: Drought.” EPA. N.p., n.d. Web. 20 Aug. 2015. <http://www.epa.gov/climatechange/indicators/>. Bernstein, Sylvia. “The Way of the Future: Aquaponics vs. Traditional Agriculture.” Inner Self. N.p., n.d. Web. 20 Aug. 2015. <http://innerself.com/content/living/home-and-garden/gardening/8654-aquaponics-vs-traditional-agriculture.html>. 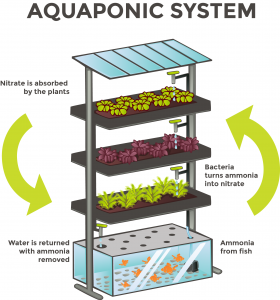 “How Aquaponics Works.” How Stuff Works. N.p., n.d. Web. 20 Aug. 2015. <http://home.howstuffworks.com/lawn-garden/professional-landscaping/alternative-methods/aquaponics1.htm>. Klein, Jaxon. “School Aquaponics.” The Aquaponic Source. The Aquaponic Source, 14 Aug. 2014. Web. 20 Aug. 2015. <http://theaquaponicsource.com/service/school-aquaponics/>.